Are you wondering what you should be keeping an eye out in 2016? Look no further, within this post I share key findings from recently published reports from PulsePoint and PageFair and Adobe highlighting key trends and stats marketers can’t afford to ignore. 1. Content Marketing is King! When most of us think about real-time content marketing, we think of examples like Oreo’s tweet during the 2013 Super Bowl blackout, when they advised customers that they “can still dunk in the dark.” That tweet was a great response to an unexpected occasion and the birth of the awareness of real time content marketing. Keep in mind that real-time content does not always have to be spontaneous. The majority of real-time content advertising and marketing can be prepared to some level by maintaining a close eye on preparing and trending topics material that replies to a broad range of scenarios. Brand who are setup with strong content marketing strategies will rapidly set themselves apart and cut through the noise and “win” within this arena. Brands, agencies and publishers reported that content marketing and native are both important to their organizations and strategies. But are the ad dollars and digital inventory available to back them? The answer is yes as both supply and demand are expected to grow over the next two years. While display and search still command most of the ad dollars, 37% of respondents to PulsePoint’s study named content marketing as one of the largest spending buckets. That gap is only set to narrow, as content marketing and native ads both are both projected to see increased budgets over the next two years. The other format tracking slightly behind is digital video since the formal draws a higher audience engagement which is pivotal for brands with upper funnel campaign objectives. 3. Ad Blocking Is Rapidly Expanding, and Costing Publishers Billions of Dollars. Ad blocking is increasingly a challenge to marketers and it’s estimated that the click-through rate across all ad formats and placements is only 0.06 per cent. Now users are able to be more discretionary than ever about which content they want and what they don’t. Currently ad blocking almost always happens via desktop computers, however ad blocking on mobile could soon become a mainstream phenomenon. The rate of ad blocking varies country by country. The US has an estimated 45 million monthly active ad block users, up 48% year-on-year which across Europe, 35% of the internet population (77 million users) used an ad blocker at least once a month. The report also found that ad block users are usually young and technically savvy and predominantly male. Email is a channel which can’t be ignored however with the rise of wearable technology and mobile marketers must work towards firming up their email marketing strategy. The growth in mobile is staggering and the shift is undeniable as tablets and wearables are now being dubbed the “new inbox.” Marketers must ensure their messaging is “mobile friendly,” personalized, and optimized for success. What trends do you think Marketers should watch into 2016, leave a comment below or send me a tweet. The World is Changing, How are you Marketing to a Changing Audience? The average person now spends more than 12 hours online everyday! This is great news for marketers because by 2020 over 80% of the buying cycle will be under their control. It also means that marketers will need to better understand the the mindset of online users. We need to understand what people want from their content. We live in a crowded marketplace and we need to find innovative ways to put our customers first, cut through the noise, and deliver a good and memorable digital experience. Is your brand ready? It better be with stats from the one minute snapshot above! We live in a world where people trust peer recommendations more than advertising, and users seek out information online. You MUST ensure your brand has a digital presence, and a strategy for the future. Many marketers have always said Content is King, however this year the user is king, and we as marketers must ALWAYS put our customers first. Often we forget that someone is on the other end receiving the experience that we are creating. Marketers often assume because they can do something, that they should do it. It’s important to think about what not to do while considering what we are doing. These decisions matter. We should focus on delivering clear messages, placing our customer first, and keep our brands messaging simple. Be honest, give them a reason to know you better. Today, brands should be using information to deliver more personalized experience for individual users to help them along in their customer journey. Cookie based tracking now allows a brand to better understand a users mindset and online behavior. Now with the rollout of marketing automation more brands should focus on getting to know their customers and where they are within their buying process to better deliver messages customized to where they are within their journey. It used to be a simple uncrowded space back in 1960 when there were only a few marketing channels. In 2015 it’s become a crowded space with over 70 channels to choose from! The challenge marketers will face as we continue to expand is that now will have little control over the channel since the power will lie with the user and how they interact with one another without the brand’s involvement. Research has shown that only 2-4% of a brand’s fans will see their content in an organic framework. As a result brands now should look into investing in paid social media to further leverage their message to their targeted audience. Content should be packaged with different images and messages to best optimize and leverage messaging. 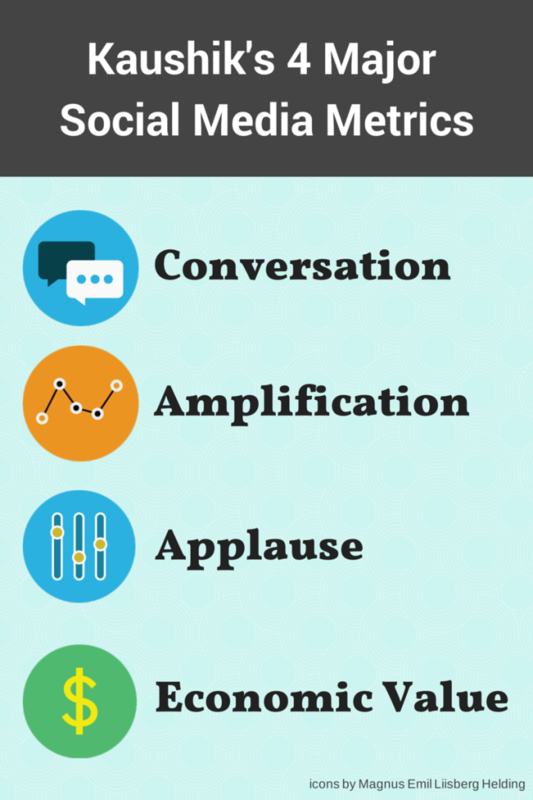 It should also be created with a strategy to be shared across various social networks. All messages and paid advertising should point to the same end channel, but marketers must test & optimize to better reach their audience. It’s important to review, tweak, reinvent and develop campaigns to enable your brand to stand out and cut through the noise. As marketers we have an end goal of creating shareable and compelling content to further expand our brands value. Often those within my role often find themselves with the challenge of ensuring it’s optimized as best as it can be to encourage sharing across social media. We need to work to create a strategy before we create content. Chris Brogan said it best, “Content Marketing is weaponized storytelling.” We must to turn the tables and use great media thinking to drive content curation, and not the other way around. 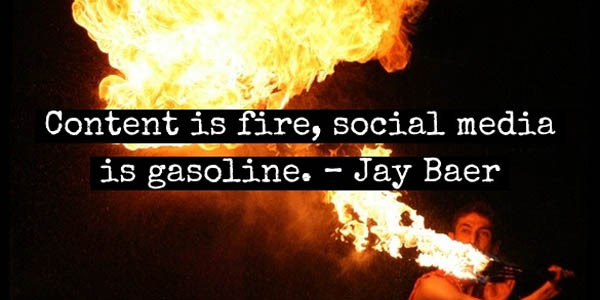 Remember, content is fire, and social media is gasoline! The human brain processes images 60,000 times faster than text with 90% of the information transited to the brain is visual. If you want to stick out on social media test video, images, and quotes. People don’t engage equally with every tweet. 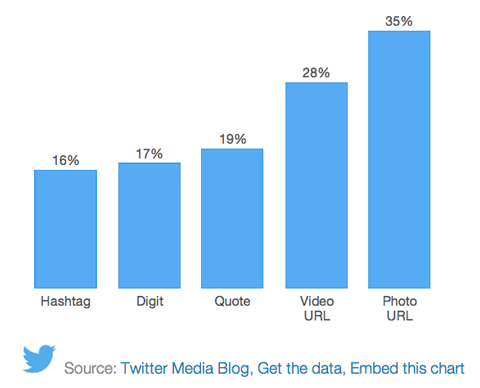 Research by Media Blog, which analyzed the content of over 2 million tweets sent by thousands of users over the course of a month, shows that adding a photo URL to your tweet can boost retweets by an impressive 35%. There’s a ton of tools to help you get started to develop free visual content, my favorite are pablo by buffer, canva, and quotr. Hope you enjoyed this post, send me a tweet and let me know what you think, or leave a comment below!